When Becky Wasserman moved from Philadelphia to Burgundy in 1968, she had no idea of starting a wine business. With her then husband, an artist, she thought it might be a good place for their two small sons to grow up. They rented a house in the tiny village of St-Romain and looked for somewhere to buy. She certainly did not expect that years later she would be credited with helping to shape Burgundy’s current reputation. ‘That sounds so pompous!’ she protests. Another new arrival in Burgundy that year was Aubert de Villaine. They became friends, sharing a love of music, wine and food. De Villaine, director of the Domaine de la Romanée-Conti, has a great respect for all that Wasserman has achieved. Wasserman trained as a classical musician but found herself in need of a job to support herself and her young sons following her divorce. ‘Opportunity is everywhere – I looked for what I could do,’ she says. having lived in St-Romain, she knew the nearby barrel makers François Frères and she set out to sell French oak barrels to American winemakers. Soon she was also representing Taransaud barrels in the US and making contacts in the Californian wine world. Those contacts were of interest to some of her local friends, the winemakers in the Côte d’Or. The relationship Wasserman has with growers, whether she represents them or not, is remarkable. At the recent celebration of 35 years of the company there were 75 domaines present, 55 of them part of the ‘Le Serbet family’, as she likes to call it. She inspires affection. De Villaine says there is a reason. ‘In regard to business, she has always been very courageous about difficulties caused by bad debts and made sure her vignerons have not suffered. She has set an important example to others in Burgundy. Apart from her intelligence and culture, she has other qualities – modesty and an absence of egoism – she is never working for her own benefit.’ In 1997 she was made Chevalier de l’Ordre du Mérite Agricole, for services in promoting the wines of Burgundy throughout the world. The ceremony took place at DRC with some of her local supporters there to celebrate – François Faiveley, Michel Lafarge and Dominique Lafon, who had worked for Le Serbet before taking over the family domaine. At the request of importers, Wasserman runs educational symposia for their customers. These take the form of an in-depth analysis of a terroir, with Burgundy experts such as Jasper Morris MW or Allen Meadows guiding the tastings and vineyard visits. In the evenings the participants drink the wines over dinner in the company of their makers. Putting wine on the table has always been important to Wasserman. An eclectic crowd, relaxed, conversation – this is, she believes, the best way to communicate a love of Burgundy. Le Serbet could not afford to entertain clients in restaurants, but this has turned out to be an asset. Over the years, hundreds of people have enjoyed sitting at the massive wooden table in the converted barn where she lives. She serves simple but delicious food, usually cooked by her husband Russell (pictured with Becky below), although she herself is an excellent cook, to go with wine from her chosen growers, whether they be simple commune bottles or grand crus. 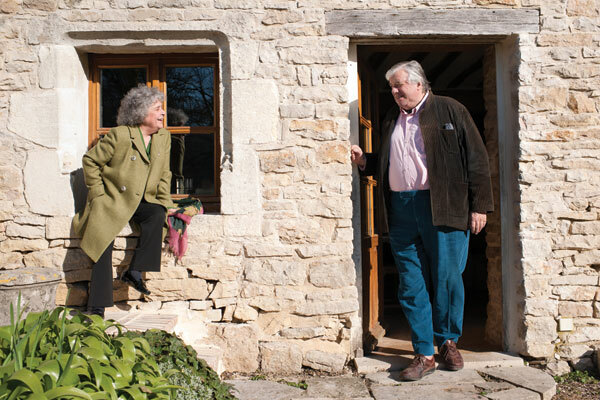 ‘She has always worked to make people understand that Burgundy is not just about grands crus,’ says de Villaine. ‘There are many wines that are little known, modest labels that are also part of the pride of Burgundy – she has championed well-made examples as a counterbalance to people like Robert Parker and Wine Spectator.’ She has introduced consumers to younger winemakers, among them Benjamin Leroux, David Croix and David Moreau. She is still enthusiastic about emerging talents: Sylvain Pataille, an oenologist in Marsannay, is one she thinks fascinating. Wasserman has seen a big change during her career. ‘Pinot Noir was seen as a weak and temperamental grape when I started. Burgundy had already been around but people were afraid of it. They thought it was going to be unstable. Now they are willing to try it. White Burgundy was more appreciated but now that Chardonnay is planted all over the world it is less associated with Burgundy. ‘When I started working with Frédéric Mugnier, no one liked the wines – they were too pure. It was still an era when commentators wanted big wines, with – hideous vocabulary – “mouthfeel”. What Frédéric does has almost engendered a whole school. The wines have transparency, not opaqueness. Wasserman shows no sign of retiring. ‘I hope to continue to make the case for lesser-known Burgundies,’ she says. ‘This is not a battle that has been won. A splendidly eccentric cellar could be created with only Beaune or Nuits premier crus – there are 40 premier crus in Nuits-St-Georges alone. I especially like Les Chaboeufs and Aux Cras. I’d like to create an interest in Beaune; Pertuisots and Les Aigrots are two favourites. I wondered how she feels about the purchase of vineyards by rich outsiders. ‘Parcels of vineyards here have been bought and sold for many years without creating headlines. The day that we hear about someone purchasing a hectare of old-vine Aligoté, I will celebrate,’ was her response.